Hello everyone! I know we just posted a frozen dessert on Wednesday, but this ice cream had to be posted. You will understand why if you make it! Cannoli are our favorite Italian pastry, without a doubt, and one of our favorite desserts. Isgro Pastries in Philadelphia is our favorite place to buy them. Their cannoli are exactly the way they should be- a crispy, fresh shell with a creamy ricotta filling and a nice dusting of powdered sugar. They are amazing! Since we love the flavors of cannoli so much, when we saw cannoli ice cream, we knew that at some time we would have to try it. 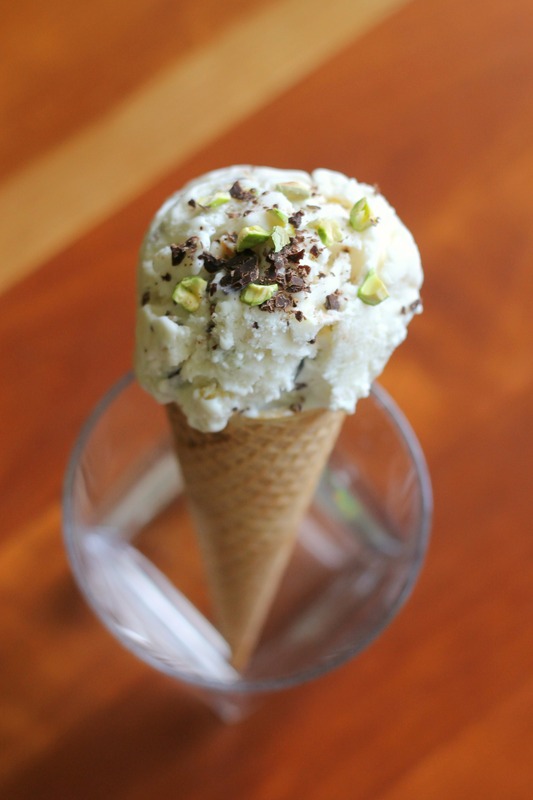 The base of this ice cream has ricotta and a little cream cheese in it (probably to help keep it creamy since all ricotta, even full-fat, is slightly grainy), and at the end of churning pistachios and chocolate are added. We tried to make homemade cannoli shell pieces to stir in, but they failed due to our lack of experience deep-frying anything (in simpler words, we burned nearly all of them!). But it did not matter! This ice cream is perfect in pretty much every way: it’s creamy, it tastes great, and it’s the type of ice cream that doesn’t require egg yolks/cooking, which is a huge plus. It is quite rich, so a little goes a long way. Enjoy! In a bowl combine heavy cream, milk, sugar and corn syrup and blend with an immersion blender on low speed for about 1 minute. Add the ricotta, cream cheese and vanilla and blend until well pureed and smooth. Chill until completely cold (we usually chill our ice cream bases overnight). Freeze in an ice cream maker according to the instructions that came with the machine. Add in cannoli shell pieces, if using, chocolate, and pistachios during the last minute or two of freezing. Transfer to airtight container and freeze for a couple hours. The ice cream is best served slightly soft, so let it sit out for 10 minutes or so before scooping. Enjoy!